Discover the Mekong River onboard a British-Indian Colonial vessel. Featuring a sun deck with a large Jacuzzi pool, spa, gym, observatory lounge, restaurant and outdoor bar, each of the 26 cabins has its own private balcony. River cruises range from three to seven nights. 3 Voyages have been designed (“The Lost Civilization”, “The Serenity Cruise” and “The Pearl of the Orient” – details in schedule below). Private excursions with a personal guide are also available. Please click here to view full schedule for upstream and downstream cruises from Saigon, Phnom Penh or Siem Reap. All Superior Staterooms feature bright tones with reddish walls and artworks, and are situated on the main deck. Gracefully designed, they have white wood furnishings. The 30 m² cabin has a large 4 m² private balcony and a queen size bed. The bathroom features an oversized shower and the lounge partition is inviting for a rest on a sofa amidst river views. Four twin bedrooms (convertible into double bedrooms) are available. Located on the upper deck, and with a total space of 30m², the Deluxe rooms feature colonial furniture and hand painted ornaments that underline an Indian theme. There are 8 Deluxe rooms on board, each with its own balcony (4 m²) and a queen size bed. Two twin bedrooms (convertible into double bedrooms) rooms are available. Two Signatures are located on the main deck (36sqm in total, 5sqm balcony) and two sit in the front area of the upper deck (32sqm in total, 4sqm balcony). All four have a white-crème facade topped with hand-made marvellous indigo blue Indian patterns, borders and ornaments which give the cabin a dignified appearance. The large wooden four-poster king bed is accompanied by a heavy treasure chest at the foot end to store your belongings. Two individually designed suites, ideally situated on the upper deck. 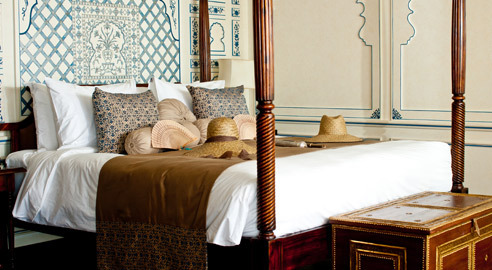 - The Taj: This Indian Suite is peppered with Indian designs. A feast for the eyes, it features dark wood with camel bone inlayed chairs, tables, cabinets, side tables and a vanity case. The dining lounge, an extravagant solid camel bone sofa and the large majestic wooden bed evokes a full Shah feeling. This suite has two private balconies (11 m² in total), one of which has a Jacuzzi. The large pool, constructed with intricate Turkish Mosaic floor tiles, is an oasis to refresh or to soak in the rays of the sun on restful sun beds. Guests can also jump into a splendid Jacuzzi. The elegant Viceroy Dining Hall is located next to the bar on the Terrace Deck and offers alfresco dining with free style seating. Ascetically designed, the Viceroy Hall is day light flooded with many high windows. The hall in azure side walls, white ceiling with golden borders and elegant finished chairs and tables shows its full royal shine in the evening when British styled luster bathes the room in decent light. The Observatory is an elegant and tasteful Indian lounge with wide cozy styled divans, where guests can play chess, simply relax after spa whilst munching on some fruit snacks, or observe life on the Mekong through the panoramic windows. It can be privatize for functions or romantic candle light dinners. The Apsara Spa offers two treatment rooms, with a variety of fine treatments and more than 20 different aroma oils to choose from. Meeting Points for transfers are Victoria Hotel in Siem Reap and Riverside Renaissance Hotel in Ho Chi Minh City (Saigon). Amemorable experience combining wonderful places along the Mekong with a mix of worldheritage sites, local life, cultures, personal encounters and a cruise on theTonle Sap River and Lake, a jewel of Cambodia. Thebest of rural Cambodia: ancient pre-Angkoriantemples, relish the cordial smiles of the inhabitants of this region and acruise on the Tonle Sap River and Lake, a jewel of Cambodia. A lower Mekong cruise showcasing the evergreenlife of the Mekong Delta. -Accommodation, daily (group) shore-excursions as mentioned in the program, allentrance fees, transportation as mentioned in the program, transfers to/fromthe meeting point/ship, tour guide services (English speaking), taxes, fuel,river pilots, local anchorage fees, daily Tai Chi classes and onboardentertainment, sauna or steam bath, welcome drink, breakfast – lunch - dinner(on full sailing days or as indicated in program), free flow of beverages -mineral water, soft drinks, juices, tea, coffee - at all times, free flow oflocal beer and house wine by glass during lunch and dinner, drinking water incabin and during excursions, insurance (passenger liability), internetthroughout the boat (subject to cellular network signal). Porttax, crew and guide gratuities, any visa fees, private transfers and any othertransfer not stated in the program, personal expenses and purchases, allfurther beverages, premium spirits and other services not mentioned underinclusions or in the program, fuel surcharges if any, medical services, spatreatments, telephone.